The title "A variable expansion speed theory of gravity" Is not a book title; it's the title proposed to me for this discussion. What ever posts that follow this presentation of the book is further results obtained after the book's. The discussion wants to cover every involvements of the "gravitational effect". So I don't know where it will lead me exactly. Up until today, it has lead me from Plank's epoch to the dawn of life, without any "gaps" . Controlling kinetic energy of the universe seems to be impossible. The “sub-particle” responsible of expressing that energy is the neutrino. And neutrinos are so hard to “control” that for now, we can almost never even observe it’s “interaction” with anything. Neutrino’s motion is what creates “space”. But the neutrino is the “basic unit” of Time, which is smaller than the basic unit of “space”. In fact a neutrino doesn’t have any “size”; it is a bi-dimensional “event” (energy state). Even Plank’s Time unit is relative to the Planck’s space unit; it’s not the “real” Time unit. Planck’s Time unit 10^-43 second is in relation with 10^-35 meter; which is the smallest distance possible in “space”. We have to understand that “space” started at 10^-35 meter; but Time started at ZERO; so 10^-43 second isn’t the smallest “time lapse” possible. Nevertheless the “fact” is that “mass-energy” can control “kinetic energy’s” expression at the “space” level. And it is the only existing energy that can do it. 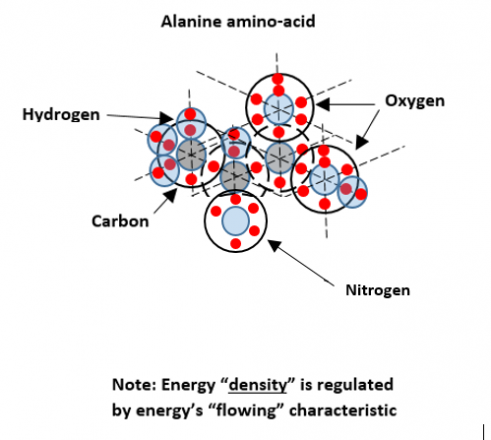 The reason is simply because “mass-energy” is “kinetic energy” oriented differently. “Mass-energy” can “slow down” neutrinos, it can “stop” neutrino’s forward motion, and it can even “push back” a neutrino in Time, making it retreat on the Time arrow it has already traveled. But the reality is that “mass-energy” only stops a “basic space unit” into which neutrinos travels at light-speed. So “mass-energy” has no “direct effect” on neutrinos; it affects only the basic space volume containing those neutrinos. That “effect” of mass-energy is called the “gravitational effect”. And we can observe it easily in our environment. The question becomes: Could we use “mass-energy” to control “kinetic energy”, which would mean “controlling Time”? This control of Time would permit us to go back “in the past”. As for the “future” we couldn’t go to it, since it doesn’t exist yet. The reality is that we, continuously, go to the “future” moment, but only as soon as it becomes a “present” moment. And that “present Time unit” is so small that we cannot hold to it long enough to “observe” it while it lasts. A photograph captures it; but we always observe a photo of the “past”. The existence of “mass-energy” is the result of the appearance of the gluon particle in our universe. This gluon particle has an identical “size” to the neutrino; but a gluon affects a much greater definite “space volume” which has a diameter of 10^-15 meter, while a neutrino affect a space volume of only 10^-35 meter. Until now, no one has never observed a “free” gluon. Gluons were detected by the jets of hadronic particles they produce in a particle detector, soon after they are first created. This means that gluons precede the jets created. Positrons and electrons were collided, producing an intermediate photon that then produced a quark and an anti-quark as it decayed. This process results in two jets of hadronic particles as the quarks form hadrons. Sometimes one of the final-state quarks radiates a gluon just before it "hadronizes" (that is, forms into hadrons such as protons, pions, neutrons, etc.). 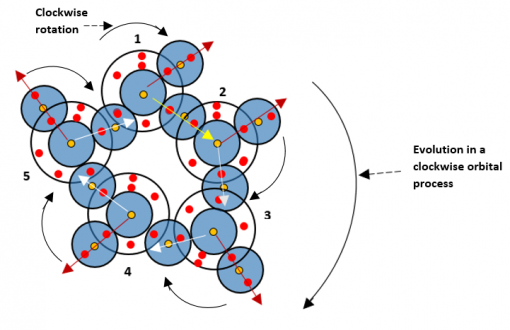 This gluon will form a jet of its own, producing an event with three jets, instead of the usual two. Note that this gluon is the second generation of gluons we’ve already seen in the decay process. 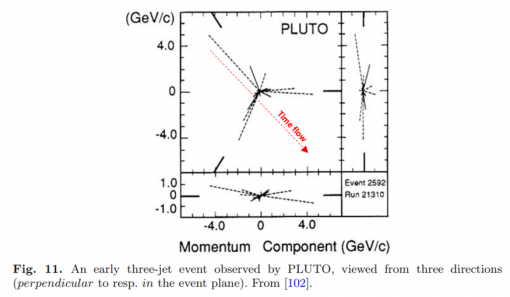 Four different detectors at PETRA in 1979 reported observing the three-jet events with just the right frequency and just the right characteristics to be consistent with gluon production in so-called planar events (as we have seen, gluons are surface sub-particles so their decay as to be “planar”) and three-jet events, were discovered. Later experiments at CERN and Fermilab confirmed these results. To me, those three-jet planar events would be the splitting of the two sides of a gluon sub-particle which become “quarks”. Having to increase the energy in order to be able to observe these events means having to go further back “in Time” before the quarks event. The red Time flow was added by me. From 1989 at the Large Electron-Positron collider LEP at CERN and the SLC collider at SLAC, differences between quark jets and gluon jets confirmed the higher color charge of gluons compared to quarks. That color charge being “the strong force” simply means that the “gravitational effect” at this level possesses more density (energy) than when quarks appear. And this fact confirms the succeeding appearance of quarks after gluons. Could we use gluons to “control” kinetic Time energy? I don’t think so, because gluons don’t possess “mass-energy”; this means that we would have to use “quarks”. Now we know that the “mass-energy” of a Top quark is enough to “block” the expending motion of a “space unit”. Meaning that adding an Up quark to a Top quark would be enough to push back the space unit in “Time” (back on the Time arrow). But quarks cannot be found individually. And this would mean that the least number of quarks possible to be re-united would be a “meson”. Once again, a “meson” is unstable because it is made of the same two particle/antiparticle (quark/antiquark). Adding a “meson” to a “meson” would produce a tetraquark (four re-united quarks). In June 2013, the BES III experiment in China and the Belle experiment in Japan independently reported on Zc(3900), the first confirmed four-quark state. In 2014, the Large Hadron Collider experiment LHCb confirmed the existence of the Z(4430) state. In February 2016, the DØ experiment reported evidence of a narrow tetraquark candidate, named X(5568). In June 2016, LHCb announced the discovery of three additional tetraquark candidates, called X(4274), X(4500) and X(4700). So the “fact” is that we are only starting to “observe” such particles; and it doesn’t seem that we are on the verge of “creating” new ones yet. Creating “new” kinds of particle that seem impossible to exist, would be the only way to help us control Time. On the other hand, gluons don’t possess “mass-energy”; but maybe if we could “capture” a gluon before its surface splits, we could use its “inner” topology “toward the center”, in order to steer energy where we want it to go, affecting “Time” as we want it. This seems to me, the only logical possibility for this “fictional” kind of research. Finally, it’s impossible to control Time. Let’s see the impossibility to control time. Time is manifested kinetic-energy. It’s oriented “forward”, towards the “future”. Time cannot “flow” towards the past. We know that a “space unit” can be “blocked in time” by mass-energy. But “blocked in Time” doesn’t mean that “Time is blocked”; it means that the “space unit” is blocked while Time keeps flowing. 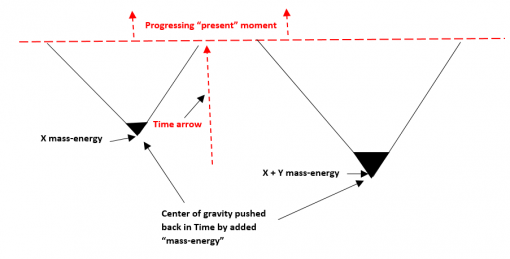 So by adding “mass-energy to a center of gravity, we can push that center further back in time but it doesn’t affect at all the progressing “flow” of its “present moment” on the “Time arrow”. It only pushes back the “date of birth” of that center of gravity. We can say that, while it is “pushed back” in Time, Time accelerates for that gravity center; but even if this acceleration is felt by the center of gravity, it doesn’t affect its “present moment” carried forward by the universal “Time flow”. …on the production of cells from the “molecule source” implying, exclusively, “gravitational-tidal effect” ; but there’s so much different implications involved between this “transitional period” of both results, that I’m pretty sure I missed something during the molecule’s production. And I’m looking for it. Why can mass-energy stop the basic metric of “space” without stopping the neutrino? The answer is now obvious. It’s because expansion kept on when gluons appeared and occupied all of existing “space”. But, even if gluons, perpendicular to neutrinos, controlled the “space” available at that moment, they didn’t “master” all of “space-time”; and time-energy (neutrinos) kept on flowing, producing more “gluon-free” space. I’ll be back when I gather other information. The water molecule is the most important factor present in cells. It “transports” everything needed or evacuated. So we will start by analyzing it with what we know. We mustn’t forget that “electronic energy” behaves as a “liquid”, and “flows” towards electronic shells that have not reached their “full” energy density. When it meets a “full” shell, it simply keep flowing towards another shell. Furthermore, the point of “entry” of energy, in an atom, is always at the 12 hour position, perpendicular to the atom’s main “Time flow” (3hr <-> 9hr). Water is present both inside and outside cells. In the body of a mammal for example, although it is about 70% water by weight, about 46% (approximately 2/3) is inside cells, and about 23% (approx. 1/3) is present outside cells in blood plasma and other body fluids; which surprisingly, is the structure of a proton (1/3 + 2/3 quarks). This would indicate that a basic structure adopted by “nature” as being viable, is always re-used in further “experiences” (attempts). “Because of its polarity, a molecule of water in the liquid or solid state can form up to four hydrogen bonds with neighboring molecules. These bonds are the cause of water's high surface tension and capillary forces”. Note that all “energy states” are installed on the “gravitational lines” (pair number hours). 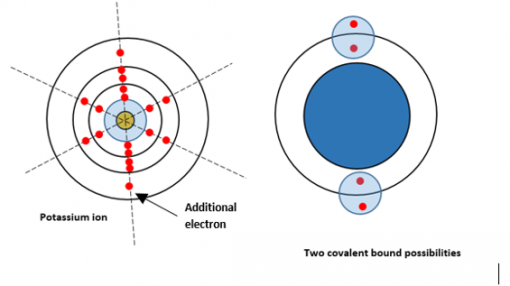 Surprisingly, the “Four electronic bounds” shows an Oxygen atom (A) that has not its valence shell “energy filled”, while the “Three electronic bounds” has all oxygen atoms valence shells “energy full”. But it must be different if more molecules are drawn. The four electronic bounds situation must represent water at its most “dense” state, which is as a “liquid”. The drawing shows clearly how little liquid water is compressible. Note that water is one of the few, if not, the only liquid that is denser in its liquid form. All other are less dense in their liquid state than in their solid state. This would mean, according to equilibrium with the environment density, that water is the first real "liquid" to appear in the universe. 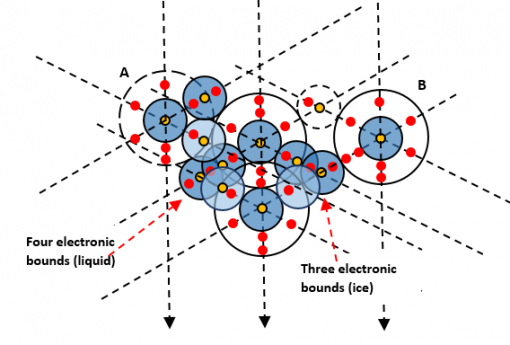 The three electronic bounds situation would, then, show water in its “frozen” state (ice). And it is easy to see that pressure would only “break the ice” (break the bounds of molecules) without separating hydrogen from Oxygen of the water molecule. Which leaves us with the two bounds situation that should be water “vapor”, as shown in the following drawing. As we can see, all “energy states” are, once again, installed on the “gravitational lines” (pair number hours) and, in the gas state, none of the Oxygen atoms have an “electronic full” valence shell. On the other hand, all hydrogen atoms are “full”; which shows, once again” that water vapour isn’t much compressible either. As for my search of what I’ve missed about molecules, all I’ve found yet was that there was a lot more “transitional phases” involved at the beginning of the universe than I has anticipated. If we describe the Big bang, which was the first transitional phase, as an “explosion”, there was a few more “explosion” that I hadn’t noted. 2-Inflation being an “explosion” of fundamental particles. 4-First stars formation must have been another “explosion” effect. 5-Molecules apparition must also have been quite an explosive transitional phase. 6-It’s an “explosion” of diversity of “experiences” tried by the universe to gain “viability”, which leads us to cells production. This is the “explosion” that blows me off my feet…for now. I’m still working to find an option for a simple view of the event. A while back, two black-holes collided and sen out gravitational ripples out into the universe. Allegedly, it was powerful enough to cause 4 recordable distortions in the shape of the Earth. If we can work out the velocity from the event to it's effect on Earth, it should give a representative speed of travel. Discovery of these effects won a Nobel prize and apparently suggest that gravity does (or can) travel in waves. Unlike EM waves which have a set speed, it may be possible that gravity travels at variable rates. I think this will become apparent as we learn more. I have a hard time imagining "gravitational ripples", since gravitation has no energy and "space" cannot be deformed. This leaves only the neutrino radiation background (at 1,9 K) to be "disturbed" by that collision. Which, in fact, wasn't a collision but the "merging" of two black holes. It's not impossible; but I would have much difficulty to accept it without a logical explanation. Hi Andrex. I hope the link here helps some. I think it supports my position to a degree, though I don't pretend to understand the math. I seem to recall the Nobel committee were well enough impressed that they issued a Nobel prize for the discovery. Cornell University published this paper on the subject in the science journal nature. This means that the “exactitude” of the result is based on the “correctness” of the expected arrival time of the pulses. If ever there is a discrepancy found, it would mean that “expected existing” gravitational waves arrival pulses do not “concord” with “expected calculations”; which is far from proving that these “gravitational waves” exists”. Scientists had the same kind of problem with stars around galaxies that were moving faster than “expected calculations”. So they accepted the existence of a non-visible, impossible to detect, non-interacting with “normal” matter, as THE solution and called it “dark matter”. The reality is that “gravitation” doesn’t “ACT”; it is a simple geometrical “consequence” of space-time. So since there is no “pulling” or “pushing” in the gravitational effect, adding dark matter doesn’t mean anything. It only solve a problem in the wrong interpretation of gravity. Nothing else. And this “wrong interpretation of gravity” suggests that gravitational waves exists. This could be a “belief” that is just as wrong. So, like I said, I’m far from being convinced yet. On the other hand, when you read about the work that these scientists do... These guys are marvelous! I agree that dark matter remains a convenient construct based on gravitational observations on other bodies. But no particle has been found, and we're told that it's pretty much ubiquitous. It may exist, but I would like to see some proof. Find some dark matter and you would be remembered throughout history. Dark matter can give someone immortality! For now I'm going accept gravitational waves probably do exist, but there's still a lot of work needed. It could open up some new hypothetical possibilities like a gravity drive for space travel. One question, does the inherent gravity of a particle change when it accelerates to near light speed, or is it a constant? That would be an interesting observation. Well, being old as I am, this occasion is very welcome; thank you. So, here goes! C) The around 70% remaining is the energy of the universe itself. Regarding A) I agree with the 5% of matter. As for the other two, we know that all pieces of “matter” is surrounded by a space-time “deformation”; which sums up, to me, as B) + A) = 30% of the universe. Because matter doesn’t eliminate space-time, it occupies it. So “matter” is part of that 30% of the universe. Note that the "gravitational effect" is "local" and not "universal". At Newton's epoch, everyone thought that the universe was simply our galaxy, which made gravitation "universal". Since Edwin Hubble, we know differently; at least some of us. In regard to C) it is, and I agree, the energy of the universe that manifests its “expansion” everywhere, except “inside” the 30% volume of space-time composed of A) + B). Note that the "acceleration" of space production doesn't need energy, if the notion behind the Higgs field is correct. We've seen that already. So there's no need for dark energy either. In other words, dark matter could simply be “deformed space-time” which is invisible but not impossible to detect, since we clearly enough observed it in the “bullet cluster”. Geez! I feel younger already! 1-What does the term “gravity of a particle” represents exactly? 2-How can a “mass-energetic” particle accelerate to a near light-speed? The only particles we are sure of going to light-speed are the Photon and the Gluon with no mass-energy, while the neutrino has so little mass-energy that we cannot measure it precisely? 3-What does “constant” means exactly, in a gradual continuously decreasing density of universal energy? Gravity Wave discovered Sept 14 2015. I did not say that scientists did not find a discrepancy in comparing "length results"; I'm saying that I was doubtful to being related to "gravitational waves". And I'm not saying this without verifying first, all "explanations" available in reports. I was referring to this comment. I think it may be that these waves will be better understood in time. What's more, it's probably not an EM wave or they would probably have been discovered some time ago. Throw a pebble in a pond and you can watch the ripples propagating. Its clear that something doesn't necessarily have to be EM to cause waves that propagate, in our case through the spacetime matrix somehow. I think we are exceedingly lucky to be living in such an interesting age of discovery. If we can learn the actual nature and physics of gravity and how it propagates, we may find ways to manipulate it. It may be that gravity drives, and "artificial" gravity (Induced gravity?) could revolutionize space travel in particular. That is so exiting as it may then allow us to explore deep space, but not in my lifetime I don't think. Thankyou guys for sharing your knowledge with me. I know most of what i've said here is conjecture, but sometimes conjecture becomes reality, and that would be uber cool. Well, your opinions and ideas are just as good as mine until all understanding is mastered. The interesting part is exchanging them. While, in the expanding space-time, nothing else beside dilution of energy density was happening, inside the “gravitational fields”, evolution was “exploding”. It’s not easy to simplify the extraordinary “explosion” of attempts, or experiences, made by the universe to attain “perfect” equilibrium in these “gravitational fields”. It’s going to even be harder, I think, to relate these attempts to any “gravitational effect”. But since we’ve been succeeding with all previous evolution, we have to try to discern it. Researchers, during the last two century, have gradually uncovered the richness of the successive specialisation of matter, inside these “gravitational fields”. Their researching process was by defining gradual smaller “matter pieces” with their specific characteristics. If we make a comparison, we can say that they decided to analyse a house. They first studied the exterior walls, that they found made of bricks which they discovered were made mainly of silica and alumina. They also found other kind of walls inside the house, made of different materials they analysed, surrounded by all sorts of objects placed randomly in the interior walls environment. They succeeded in defining all characteristics of each objects that they found. The result was such an accumulation of information that it became difficult to relate all to one another. But even this example is far less complicated than what was discovered by biologists. The sum of data recovered, with so much precision in their characteristics, is so unbelievably diversified that it’s hard to have an idea of its global functional implication, and we have no precise idea as to how this came to be so well organized. Nonetheless, there could be a way to simplify the approach for better comprehension. Let’s try it. The same way we have used the “field” notion to analyze the standard model, we should use the “container” notion to analyse the first evolution stage inside “gravitational fields”. In fact, we will be using the same “notion”, since “fields” are “space containers” and, starting after the molecule level, we simply make a transition to the notion of “solid containers”. - unicellular containers combine to form multi-cellular containers. In fact, molecules produces organelles (walls) inside the unicellular containers, which results in multi-cellular containers. Either way, we understand that molecules evolve into “containers” production. From this point on, to view evolution, we have to adopt another notion which is the “structural notion”. If we come back to our example of the house, cell containers are bricks, tissue structures are exterior walls, organelles are interior walls, organ structures are rooms, and living organisms are the house. But this part of the molecule evolution is only the “container” and “structural” production aspect. Molecules made a lot more than that. They also produced all the environment of all containers and all structures around and inside “the house” with very small exceptions. To obtain the living organism, the universe used four different types of its molecules which are proteins, carbohydrates, lipids and nucleic acids. They also produce non-living organism with their other types, as the atmosphere and the oceans where the "gravitational effect" is evident. Furthermore, some non-living organisms are remnants of living organisms. For example, coal, wood, rubber, paper, etc. are considered as non-living things, in spite of initially being a part of a living tree. It should be interesting to describe the transition from one state to the other. On the other hand, because of our notion of “chemical bound”, molecules are prevented of being the producer of the majority of familiar solid substances on Earth, including most of the minerals that make up the crust, mantle, and core of the Earth. For these materials, the molecular structure is not identifiable, even though we are aware that "centers of gravity" are the basis of their "structure". Which means that atoms (elements) was considered, by the universe, as a completed “evolution level” which has attained successive “stability” in the noble gas elements. This is as logic as everything else the universe made, since we will be able to “install” our molecules production on “solid ground”. Naturally, the process of “flowing energy”, by “tidal effect”, used to attain “stability”, being so effective previously, it must have been kept in function through the succeeding evolution of the “molecule level” that we have just finished describing. We will continue our study of molecules through the process that brought life to organisms. We don’t know if living organisms exist in “space”; so we will limit our analysis to the process that created life on Earth. And since life appeared on Earth almost at its beginning, we will start with organisms that could adapt to the young Earth environment. I’ll try to find a simple way to present it. Let’s hope I’ll be able to use a “gravitational effect” of some sort; otherwise my next post won’t be acceptable in this discussion. ...we have to remember would be that non-living "things" are related to centers of gravity (falling effect) while living organisms are related to "tidal effects". “Considering the “time factor” is essential to understand everything we want to analyze in the universe”. To this, I’ll add that my last post hides a description that wasn’t done yet. Since living organisms are produced by the interactions of different “tidal effects” between connected “gravitational effect”, we can recognize the same repeated “accretion” process that produced atoms. The difference relies only in the fact that molecule’s “accretions” are more “discreet”. “Centers of gravity” join (bound) less “tightly” to form molecules, than when they “fall” on one another to form atoms. In other words, in molecules, it’s not the active energetic centers of gravity that join into one; it’s the bigger passive “gravitational effects” that install “communication links”. How can “Molecules fields" proceed to attain the "unicellular containers” level? I’ve been able to simplify a bit, but we have to use official information as they are, before really simplifying. So let’s begin our search. It’s obvious that the cell didn’t appear in nature, already organized and completed. It had to be the result of an evolution path (period) starting from the molecule. And since the universe tries every possibilities continuously at hand, we can anticipate “complexity” (entropy) along the path that succeeded in augmenting the stability and viability of evolving “things”; even if many of the attempts were afterward disregarded. Fortunately, we can surmise that cells appeared first in water since they needed water to contain every of their components. But this water, at the start, had to contain other kinds of molecules which “fabricated” the cells. So where can we begin? 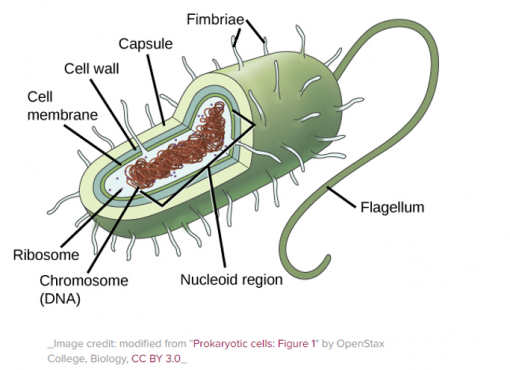 First let’s take the prokaryotic cell, which must have appeared before eukaryotic cells, and try to find what part of it appeared first. At this point, we can eliminate the capsule and all that is related to it; meaning flagellum and fimbriae. This leaves us with the cell wall and the cell membrane. After a bit of research, it’s easy to understand that the cell wall’s function is to protect the membrane. So this means that the membrane came first before developing a protection. The following question is, can the membrane appear before whatever it contains? The answer is yes, because this membrane is porous and can let pass even macromolecules. This unicellular “container” (membrane) is full of a jelly-like fluid called cytosol. Its viscosity is roughly the same as pure water. The cytosol consists mostly of water (70%) into which float dissolved ions, small molecules, and large water-soluble molecules. The structure of this water in the cytosol is not well understood; just as the structure of pure water is poorly understood, due to the ability of water to form structures such as water clusters through hydrogen bonds. The classic view of water in cells is that… “about 5% of this water is strongly bound in by solutes or macromolecules as water of solvation (solvent action with molecules and ions), while the majority has the same structure as pure water. Solvation involves different types of intermolecular interactions: hydrogen bonding, and ion-dipole interactions”. As we already saw, all these events depends on the “flowing” characteristic of the “electronic energy”. Water can both donate and accept hydrogen bonds; which explains why water is the main environment where cells appeared. Naturally the cells are also contained in water; but in contrast to extracellular fluid, cytosol has a high concentration of potassium ions and a low concentration of sodium ions. This low concentration of sodium ions is the result of an enzyme that pumps sodium out of cells while pumping potassium into cells (we don’t have to object at the existence of “pumps” in molecules, since we understand that it is the “electronic energy density” that controls the forming of atomic ions by the “flowing in”, or out, of an electron). “This pumping action uses energy from a nucleoside triphosphate called ATP”. The reality might be that this nucleoside could simply be the “flowing surplus” of electronic energy from different atomic ions. We mustn’t forget that an “electronic energy unit” (electron) possesses a “rotation motion”. “For every ATP molecule that the pump uses, three sodium ions are exported and two potassium ions are imported”. Chloride ions also exit the cell, through selective chloride channels. The loss of sodium and chloride ions compensates for the osmotic effect (by density pressure) of the higher concentration of organic molecules inside the cell (and since everything is energy, the “density pressure” control remains to the “tidal wave” flowing process). The low concentration of calcium in the cytosol allows calcium ions to open calcium channels so that calcium floods into the cytosol. This sudden increase of calcium activates other signalling molecules, such as calmodulin and protein kinase C. Other ions such as chloride and potassium may also have signaling functions in the cytosol, but these are not well understood. As you can see, the cytosol is already quite complicated; but we’ve already cleared the process a bit. So let’s come back to the cell membrane. The cell membrane consists of a lipid bilayer with embedded proteins. This protein component provides us with another step toward the “beginning” of cells. Proteins had to appear before cells, to form cell membranes. Proteins macromolecules, consist of one or more long chains of amino acid residues, which permits us an additional “backward step” in time, to amino acids. 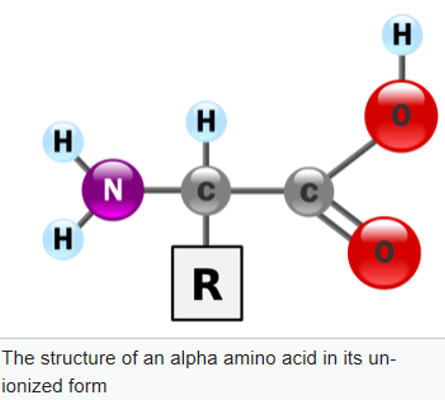 Amino acids are organic compounds containing amine (-NH2) and carboxyl (-COOH) along with a side chain (R group) specific to each amino acid. 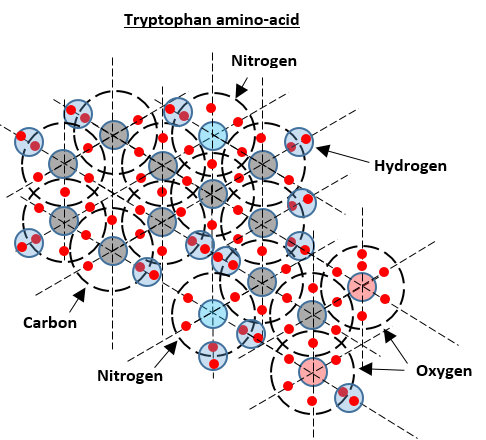 The key elements of an amino acid are carbon (C), hydrogen (H), oxygen (O), and nitrogen (N). About 500 naturally occurring amino acids are known; though only 20 appear in the genetic code. These residues are what is left when water molecule is rejected. Which means that water molecules are chemically implicated in their formation. Twenty of the amino acids are encoded directly by triplet codons (composed of three nucleotides) in the genetic code, and are known as "standard" amino acids. A three-nucleotide codon, in a nucleic acid sequence, specifies a single amino acid. The vast majority of genes are encoded with a single scheme. That scheme is often referred to as the genetic code; though variant codes, such as in human mitochondria, exist. Robert W. Holley determined the structure of transfer RNA (tRNA), the adapter molecule that facilitates the process of translating RNA into protein. Extending this work, Nirenberg and Philip Leder revealed the code's triplet nature and deciphered its codons. So now we know that proteins originate from RNA. In these experiments, various combinations of mRNA (mitochondrial RNA) were passed through a filter that contained ribosomes, those components of cells that translate RNA into protein. Unique triplets promoted the binding of specific tRNAs to the ribosome. There were, first three and then, two more “stop codons” identified which oblige the RNA to restart another strand. The three stop codons are UAG, UGA and UAA triplets. The stop codon alone is not sufficient to begin the process. The real initiator of the process is the start codon. The start codon is the first codon of a messenger RNA (mRNA) transcript translated by a ribosome. The start codon always codes for methionine (AUG) in eukaryotes and a modified Met (fMet) in prokaryotes. The most common start codon is AUG. The start codon is often preceded by a 5' untranslated region (5' UTR). In prokaryotes this includes the ribosome binding site. A ribosome binding site is a sequence of nucleotides upstream (5’ -> 3’) of the start codon of an mRNA transcript. Prokaryotic ribosomes begin translation of the mRNA transcript while DNA is still being transcribed. Thus translation and transcription are parallel processes. So we are now at the RNA molecule level. We already, briefly, saw this chain of nucleotides. Generally, RNA strands are considered as “half” of the DNA strand, and appears when DNA duplicates. While this is the event description of duplication, it’s is not the evolution explication of RNA. Logically, to obtain a DNA strand you have to “unite” two RNA strands; which gives to RNA the priority in appearance. RNA is a chain of nucleotides. It is found in nature as a single-strand folded onto itself. Cellular organisms use messenger RNA (mRNA) to convey genetic information using the nitrogenous bases guanine, uracil, adenine, and cytosine (G, U, A, and C), that directs synthesis of specific proteins. Each nucleotide in RNA contains a ribose sugar, with carbons numbered 1' through 5' (in red). A phosphate group is attached to the 3' position of one ribose to the 5' position of the next; which is contrary to DNA direction (5’ - > 3’). 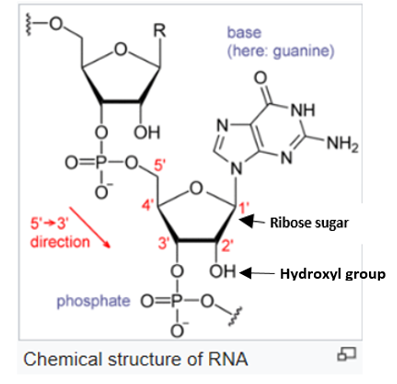 An important structural component of RNA, that distinguishes it from DNA, is the presence of a hydroxyl group (oxygen bonded to hydrogen) at the 2' position of the ribose sugar. The presence of this functional group causes the helix to mostly take the A-form geometry, although in single strand dinucleotide contexts, RNA can rarely also adopt the B-form most commonly observed in DNA. A second consequence of the presence of the 2'-hydroxyl group is that in conformational flexible regions of an RNA molecule, it can chemically attack the adjacent phosphodiester bond to cleave the backbone” (chemically” attack means “electronic energy” attack which depends on “tidal effect” as we have seen everywhere). There are more than a 100 naturally occurring modified nucleosides. The greatest structural diversity of modifications can be found in tRNA. The specific roles of many of these modifications in RNA are not fully understood. The functional form of single-stranded RNA molecules, just like proteins, frequently requires a specific tertiary structure. The scaffold for this structure is provided by secondary structural elements that are hydrogen bonds within the molecule. We have here another clear implication of “gravitational effect” with these hydrogen bounds which consist of “electronic flows” by “tidal effect”. We will continue with RNA in the next post and try to simplify it a bit more. You get a "barycenter" in the middle of the water cluster floating in the liquid. And this barycenter should possess all information about this "water cluster". I’ll have to make shorter posts for the next approach because, if not, there’s so many drawings that you’ll be thinking reading a “comic book”. 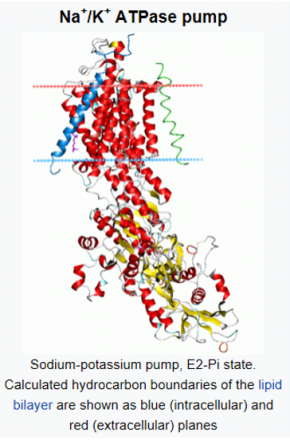 I noted in the post on molecule evolution: “…but in contrast to extracellular fluid, cytosol has a high concentration of potassium ions and a low concentration of sodium ions”. So let’s have a look at the structure of those two kinds of ions to see what is so special about them. 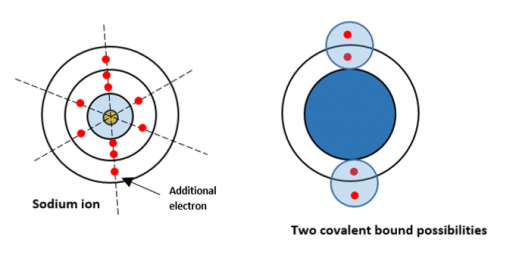 The only similarity between the two is that they both possess two covalent bounding possibilities; and these two possibility can bind to hydrogen (2 poss. ), carbon (4 poss. ), oxygen (2 poss.) and nitrogen (3 poss.) which also have several bounding possibilities and are, as we saw, the key element of amino acids. 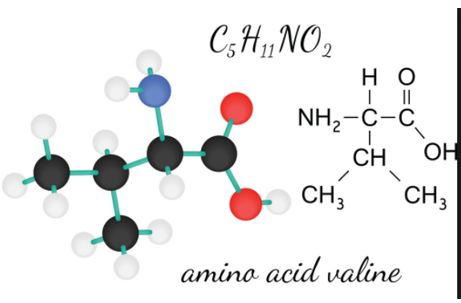 In the next post, we will have another look at amino-acids. 9 of them are essential to life but are not produced in our body. We get them in our food. They are: Histidine, Isoleucine, Leucine, Lysine, Methionine, Phenylalanine, Threonine, Tryptophan, and Valine. These next 7 amino acids are synthetized in our body: Arginine, Cysteine, Glutamine, Glycine, Proline, Serine, and Tyrosine. The 5 next amino acids are synthetized in our body from other amino acids, glucose and fatty acids: Alanine, Asparagine, Aspartic acid, Glutamic acid, and Selenocysteine. Note: Glutamine is encoded by the codons CAA and CAG and is a precursor to the neurotransmitter glutamate. In human blood, glutamine is the most abundant free amino acid and the most relevant glutamine-producing tissue is the muscle mass, accounting for about 90% of all glutamine synthesized. Glutamine is the most abundant naturally occurring, nonessential amino acid in the human body, and one of the few amino acids that can directly cross the blood–brain barrier. Humans obtain glutamine through catabolism of proteins in foods they eat. In states where tissue is being built or repaired, glutamine becomes conditionally essential. Glutamine can exists in either of two forms, L-glutamine (left) and D-glutamine (right). The L-form is found in nature. Phenylalanine is a precursor of tyrosine. The codons for L-phenylalanine are UUU (Uracil) and UUC (Cytosine). Threonine is a precursor of serine and glycine. It is encoded by the codons ACT (Adenine-Cytosine-Thymine), ACC (Adenine-Cytosine-Cytosine), ACA (Adenine-Cytosine-Adenine), and ACG (Adenine-Cytosine-Guanine). Threonine sidechains are often hydrogen bonded. Aspartic acid is a precursor of the amino acids asparagine, arginine, and four that are essential for humans: methionine, threonine, isoleucine, and lysine. It is encoded by the codons GAU (Guanine-Adenine-Uracil) and GAC (Guanine-Adenine-Cytosine), also known as aspartate. In proteins aspartate sidechains are often hydrogen bonded to form asx turns or asx motifs, which frequently occur at the N-termini of alpha helices. In the urea cycle, aspartate and ammonia donate amino groups leading to the formation of urea. Aspartic acid acts as hydrogen acceptor in a chain of ATP synthase. Glutamic acid is a precursor of other amino acids: glutamine, and proline. Glutamic acid is used by almost all living beings in the biosynthesis of proteins, being specified in DNA by the codons GAA (Guanine-Adenine-Adenine) or GAG (Guanine-Adenine-Guanine). If we eliminate all amino acids that are precursors, and their results, we are left with 6 amino acids: alanine, cysteine, histidine, leucine, tryptophan, and valine. What do they have “special”? We’ll see that in the next posts. The following amino acids have no precursor amino-acids and should have been produced by molecules. Meaning that they would be the first amino acids to appear. Alanine (Chemical formula C3H7NO2) is encoded by all codons starting with GC (Guanine-Cytosine), namely GCU (Guanine-Cytosine-Uracil), GCC (Guanine-Cytosine-Cytosine), GCA (Guanine-Cytosine-Adenine), and GCG (Guanine-Cytosine-Guanine). The L-isomer of alanine (left-handed) is the one that is incorporated into proteins. L-Alanine is second only to leucine in rate of occurrence, accounting for 7.8% of the primary structure in a sample of 1,150 proteins. The right-handed form, D-Alanine occurs in polypeptides in some bacterial cell walls and in some peptide antibiotics; it occurs in the tissues of many crustaceans and molluscs as an osmolyte. It is the simplest α-amino acid except for “glycine”. Alanine is a nonessential amino acid, meaning it can be manufactured by the human body, and does not need to be obtained through the diet. Alanine is found in a wide variety of foods, but is particularly concentrated in meats. Alanine is broken down by oxidative deamination. Dotted valence shells do not have their energy density completely “filled” by “gravitational-tidal effect”. Meaning that they still have bounding possibilities. Cysteine (Chemical formula C3H7NO2S) is encoded by the codons U (Uracil) G (Guanine) U and UGC (Uracil-Guanine-Cytosine). The chemical formula shows that it is simply sodium added to Alanine). Cysteine has the same structure as serine, but with one of its oxygen atoms replaced by sulfur; replacing it with selenium gives Selenocysteine. Cysteine is found in most high-protein foods, in meat (including pork and poultry), eggs, and dairy; in plants: red peppers, garlic, onions, broccoli, brussels sprout, oats, wheat germ, sprouted lentils. In the translation of messenger RNA molecules to produce polypeptides, cysteine is coded for by the UGU and UGC codons. Hydrophobicity scales, which rank amino acids from most hydrophobic to most hydrophilic, consistently place cysteine towards the hydrophobic end of the spectrum. While free cysteine residues do occur in proteins, most are covalently bonded to other cysteine residues to form disulfide bonds. Disulfide bonds play an important role in the folding and stability of some proteins, usually proteins secreted to the extracellular medium. Histidine (Chemical formula C6H9N3O2) is encoded by the codons CAU and CAC. Humans and other animals must ingest histidine or histidine-containing proteins. Just like animals and microorganisms, plants need histidine for their growth and development. Microorganisms and plants are similar in that they can synthesize histidine. Both synthesize histidine from the biochemical intermediate phosphoribosyl pyrophosphate. In general, the histidine biosynthesis is very similar in plants and microorganisms. I’m a bit afraid to say what I’m going to affirm now. To me it’s so extraordinary that I have been postponing it for quite some time already; but I cannot delay more what as become absolutely exact for me. I’ve been making those d….. drawings with small circles since I talked about atoms. Rare are the persons that bothered to draw them; but they should have. Because while drawing them we cannot prevent becoming conscious that whatever “binds” everything from quarks to amino-acid (for now) is the result of the “gravitational effect” that install itself on the « passive” pair number hours of the “Time flow”. It is very easy to see that my small circles are not EXACTLY in line with those pair hours because of lack of precision or maybe because the “size” of my “electronic shells are drawn approximately. If the “width” of those “electronic shells” were perfectly proportional, all “particles” would be installed on those pair hours. Which means that there is only ONE factor behind all composition, formation and accretion of everything in the universe. And this “single factor” is the “universal Time flow”. Where it is energetic (1hr-3hr-5hr-7hr-9hr and 11hr), it produces “expansion”; and where it is “passive” (2hr-4hr-6hr-8hr-10hr and 12 hr) it results in the “gravitational effect” where energy flows in order to maintain or attain equilibrium in the “energy density”. This “knockout punch” on my chin is hard to take; but I have to admit that it greatly simplifies all notions in sciences. I’ll keep on working because now I’ve got another “fact” that I can try to invalidate. 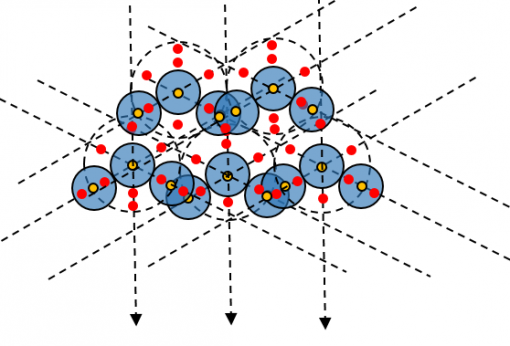 We’ve seen already that water molecules can unite in cluster. We also know that Carbon can unite in cluster. But what about Oxygen? 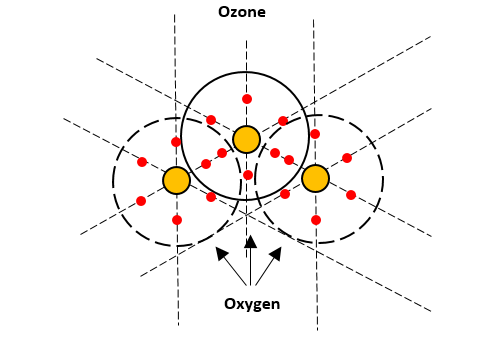 The biggest oxygen molecule cluster is the trioxygen which is, in fact, Ozone. It isn’t a “real” cluster because it doesn’t form an "enclosing” shape; meaning it doesn’t have a “barycenter”. As you can see, one of the oxygen atoms gains a “full” valence shell. The ozone layer absorbs 97 to 99 percent of the Sun's medium-frequency ultraviolet light (from about 200 nm to 315 nm wavelength). 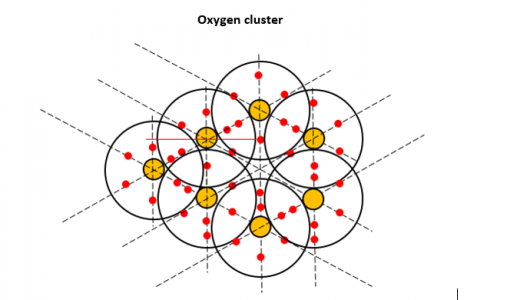 Normally, oxygen molecule clusters should be “bigger” clusters, since two of the oxygen atoms don’t have their valence shell “filled” and can make more covalent bounds. The actual explanation of why it doesn’t get bigger, is that UV radiation from the Sun, “breaks” trioxygen into dioxygen, which reassembles continuously in trioxygen. In view of my drawing, I would rather say that all three oxygen atoms get “filled” and “unfilled” alternately, by having one “electronic energy unit” (electron) pushed around by UV radiation. The ozone layer contains less than 10 parts per million of ozone. Which means that the so called “Ozone layer” is far from being Ozone only. If UV radiation didn’t “hit” the trioxygen, the “real” cluster could contain, at the least, 7 oxygen atoms. Where, as you can see, all atoms valence shells are “filled” and all centers of gravity lie on “passive” pair hour numbers. I show “electrons” (red) also standing on “passive” pair hour numbers; but this is only because of the conventional notion of “particles” applied to electrons. The “fact” remains that those electron particles don’t really exist; they are simply “electronic energy units” that “flow” just as water. Which makes them being affected by the “gravitational tidal effect”. Leucine (Chemical formula C6H13NO2) is encoded by the six codons UUA, UUG, CUU, CUC, CUA, and CUG. 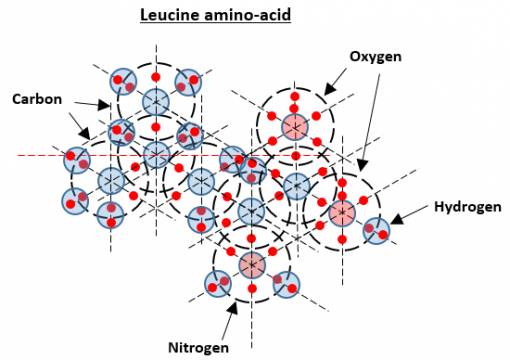 Leucine is used in the liver, adipose tissue, and muscle tissue. 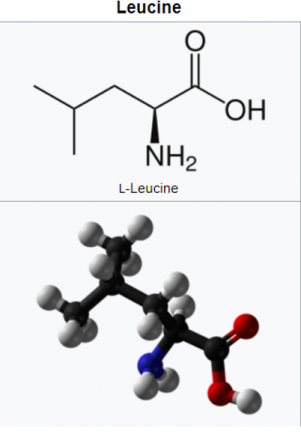 Leucine is rapidly taken up into the brain where astrocytes convert it to alpha-ketoisocaproate via transamination of alpha-ketoglutarate to glutamate. You will note that I started using the “passive” pair hour numbers to make my drawing. Note: None of the atoms (except Hydrogen) possess a “filled” valence shell. Tryptophan (Chemical formula C11H12N2O2) is encoded by the codon UGG. It is essential in humans, meaning the body cannot synthesize it; it must be obtained from the diet. Tryptophan is also a precursor to the neurotransmitter serotonin and the hormone melatonin. Plants and microorganisms commonly synthesize tryptophan from shikimic acid or anthranilate. Tryptophan is among the less common amino acids found in proteins, but it plays important structural or functional roles whenever it occurs. Tryptophan and tyrosine residues play special roles in "anchoring" membrane proteins within the cell membrane. 1) None of the valence shells are “filled” except for Hydrogen atoms. 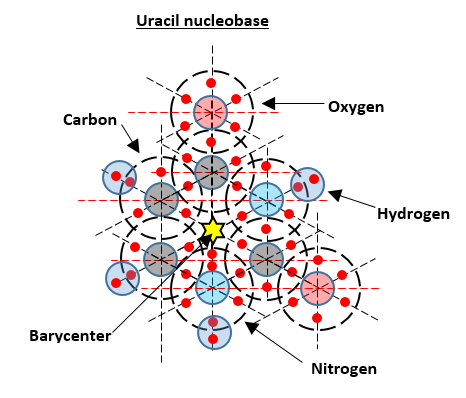 2) At the left side of the drawing we have a 6 Carbon atoms cluster surrounding a “barycenter”. This was one of the most complicated amino-acid to draw yet. Without the directive from the pair hours I would have had much difficulties to make this drawing. With their help it was easy. Valine (Chemical formula C5H11NO2) is encoded by all codons starting with GU, namely GUU, GUC, GUA, and GUG. Valine is synthesized by plants, but not by animals. It is synthesized in plants and bacteria via several steps starting from pyruvic acid. The initial part of the pathway also leads to leucine. There are no cluster in the structure of this valine amino-acid; but we can see a “Y” shape structure of Carbon atoms (to the left). What about the other simplest amino acid called “Glycine”? Glycine (Chemical formula C2H5NO2) is the amino acid that has a single hydrogen atom as its side chain. It is the simplest possible amino acid. All codons starting with GG, namely GGU, GGC, GGA, GGG, code for glycine. 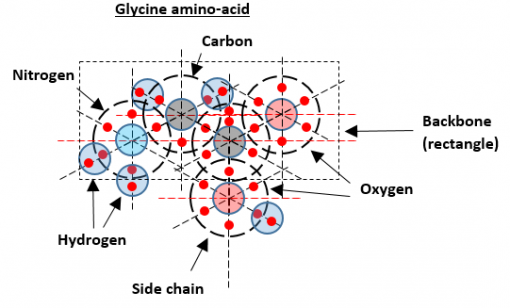 It can fit into hydrophilic or hydrophobic environments, due to its minimal side chain of only one hydrogen atom. In aqueous solution, glycine itself is amphoteric (reacts as base or acid). Glycine is not essential to the human diet. The principal function of glycine is as a precursor to proteins. Most proteins incorporate only small quantities of glycine, a notable exception being collagen, which contains about 35% glycine due to its periodically repeated role in the formation of collagen's helix structure in conjunction with hydroxyproline. Glycine provides the central C2N subunit of all purines. Purines and their tautomers, are the most widely occurring nitrogen-containing heterocycle in nature. Purine is water soluble. Glycine is an inhibitory neurotransmitter in the central nervous system, especially in the spinal cord, brainstem, and retina. The presence of glycine outside the earth was confirmed in 2009. Glycine had previously been identified in the Murchison meteorite in 1970. The discovery of cometary glycine bolstered the theory of panspermia, which claims that the "building blocks" of life are widespread throughout the Universe. In 2016, detection of glycine within Comet 67P/Churyumov-Gerasimenko by the Rosetta spacecraft was announced. The detection of glycine outside the solar system in the interstellar medium has been debated. In 2008, the Max Planck Institute for Radio Astronomy discovered the glycine-like molecule aminoacetonitrile in the Large Molecule Heimat, a giant gas cloud near the galactic center in the constellation Sagittarius. The Large Molecule Heimat is a dense gas cloud located in the molecular cloud Sagittarius B2. Many species of molecule, including aminoacetonitrile (Chemical formula C2H4N2, a molecule related to glycine), ethyl formate (Chemical formula C3H6O2), and butyronitrile (Chemical formula C4H7N), have been detected in the Large Molecule Heimat. This tells us that Glycine is the first amino acid to appear in the universe; which gives GG (Guanine-Guanine) starting codons as forming those first amino acids. As for the side chain, we can see that it is composed of an Oxygen atom with one covalent bounded hydrogen atom. The next simplest amino acid to appear would be Alanine (Chemical formula C3H7NO2) starting with GC (Guanine-Cytosine). This would also mean that Guanine and Cytosine are not the first nucleotide organic molecules to appear, since they would be “evolved” nucleotides. Which leaves us with Adenine, Thymine and Uracil to be the first nucleobases to appear. We will see them on the next post. Can we find which was the first nucleobase to appear? We will try to find the very first nucleobase that appeared in the universe. 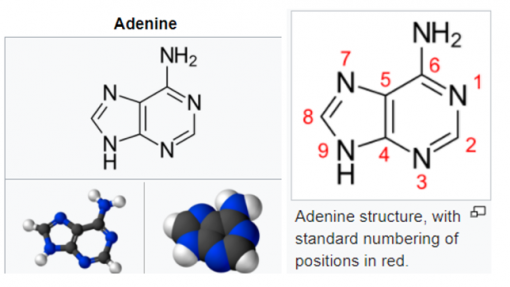 The shape of adenine is complementary to either thymine in DNA or uracil in RNA. 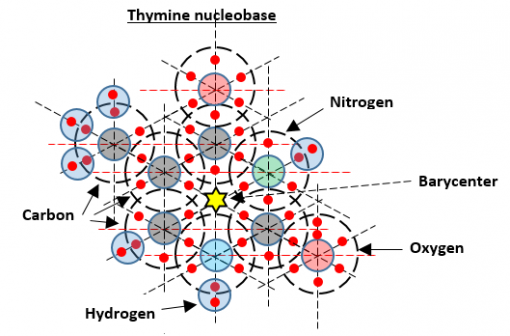 This nucleobase is remarkable because of its equal number of 5 atoms of 3 different elements (Nitrogen-Carbon-Hydrogen). It has one defined “barycenter” (yellow star) surrounded by two kinds of atoms (Carbon-Nitrogen). All Hydrogen atoms stand on the “outside” of the nucleobase; which can make other covalent bounds since all atoms they are bounded to, have “unfilled” valence shells. We mustn’t forget that energy “flows” like water, from one atom to the other, until all valence shells are energy density “full”. Thymine may be derived by methylation of uracil at the 5th carbon. In RNA, thymine is replaced with uracil in most cases. In DNA, thymine (T) binds to adenine (A) via two hydrogen bonds (???) thereby stabilizing the nucleic acid structures. This nucleobase seems to give a “hint” in the way it was formed. First the atom cluster could have formed and then, two oxygen and one more carbon atoms “attached” themselves to the cluster. But this is purely speculation, since the cluster is composed of two kinds of atoms. Maybe we will have other information further on. My mind tells me that it’s the “Y” shape formed by the four first carbon atoms (left part) that started the making of the base. Note that all hydrogen atoms are installed at the peripheral level of this nucleobase. The yellow star represents the barycenter of the cluster. We are left with Uracil: one of the four nucleobases in the nucleic acid of RNA. In RNA, uracil binds to adenine via two hydrogen bonds. Uracil is a common and naturally occurring pyrimidine derivative. It has the ability to absorb light. Based on 12C/13C isotopic ratios of organic compounds found in the Murchison meteorite, it is believed that uracil, xanthine and related molecules can also be formed extraterrestrially. In 2012, an analysis of data from the Cassini mission orbiting in the Saturn system showed that Titan's surface composition may include uracil. Evolution, i.e. "methylating” uracil produces Methylated uracil which is identical to thymine. Uracil-containing DNA still exists, for example in DNA of several phages (virus), Endopterygote (insect) development, Hypermutations during the synthesis of vertebrate antibodies. And the drawing show clearly that this nucleobase is the simplest composed base; which would mean that it was the first to appear. We will check this more deeply. On the other hand, “theories” of acid-base reactions describing exchanges of protons puzzle me quite a bit. Protons are “trapped” by gravitational effect and are certainly not tending to leave it. Furthermore there’s no “tidal effect” possible at the nucleus level. "Tidal effect" is possible strictly at the valence shell level. We have seen that three nucleobases had to appear before Guanine and Cytosine. They are Adenine, Thymine and Uracil. Which one of the three appeared first? And only one of them shows exclusively this basic molecule “shape”, which is Uracil. This signifies that the Uracil nucleobase must have been the first one produced in the universe. Can we find which the second one was? And the “Y” shape we find in Thymine is thus explained. The following step would be when the nitrogen atom introduced itself in the molecule. It had to enter at the 12hr like all energy as shown at no 1. 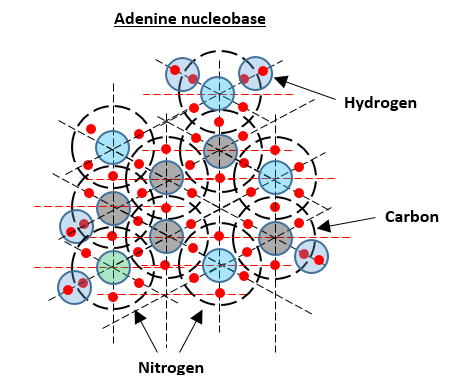 Which is the carbon basic structure of Adenine that we find when is added a Nitrogen atom. These would be the first steps for the production of the Adenine nucleobase. It might also indicate that the clusters were created later than these three carbon base "shapes". So first appeared Uracil, then Thymine, followed by Adenine; and sometime later, accretion of identical kinds of molecules added a cluster to each of these basic shapes of nuclobases. Afterward, since Guanine (C5H5N5O) is composed of two atom clusters while Cytosine (C4H5N3O) has only one, Guanine should be the last one to appear in the universe. This doesn’t mean that amino-acid or even proteins weren’t produce at the same moment; so we will have to verify it. 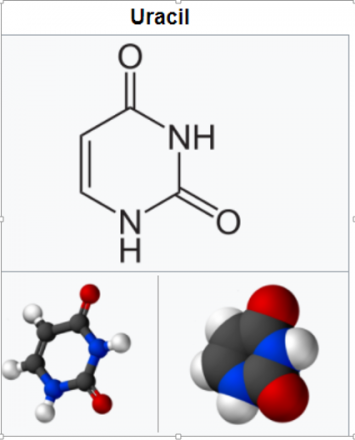 Since we found the first amino-acid and the first nucleobase that appeared in the universe, I’m tempted to find the succession of appearance of all acids and nucleobases. Let’s start with the most simplest of them. First, only by looking at the drawings we can see common structures to some of them. 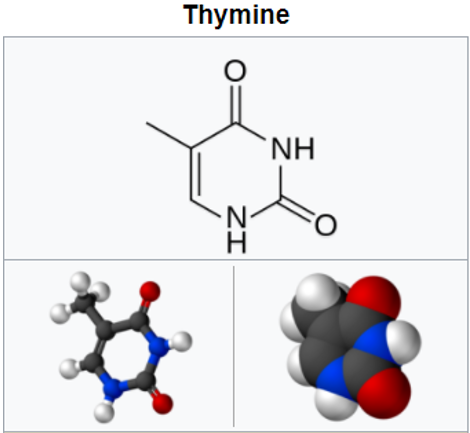 For example look at the Valine amino-acid versus the Thymine nucleobase. They definitively have similar “Y” shapes carbon structure. 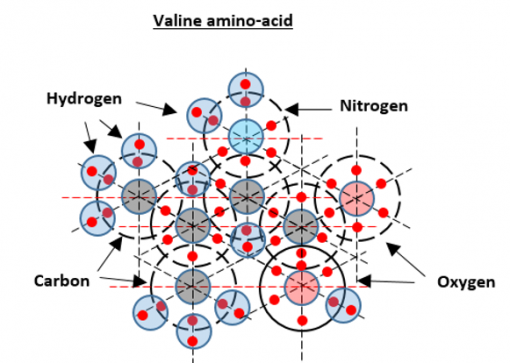 According to these drawings, Valine would come from the loss of Thymine’s barycenter because of the “ejection” of the Nitrogen atom at 6 o’clock, while the oxygen atom of 4 o’clock rolled at 3 o’clock. This supposes that a “collision” must have occurred to Thymine at 6 o’clock. What about Uracil and Glycine? Not much similarities here, except that the amino-acid seems less “evolved” than the Uracil nucleobase; which indicates a formation of the Glycine amino-acid occurring before the nucleobase. According to the clockwise rotation process, Glycine amino-acid would appear right after Alanine by the “collision” and “introduction” of a Nitrogen two bounded hydrogen atom, expelling a carbon three hydrogen bounded atom (on the left). Furthermore, we can see that the Alanine amino-acid possesses the same carbon shape forming structure as Uracil that we saw previously. But the Alanine was completed before the Uracil nucleobase was, since it has a simpler atom composition. This would mean that Alanine amino-acid was produced even before the very first produced nucleobase (Uracil). Just as Glycine which we saw formed before Uracil. There’s no doubts in my mind that amino-acids started forming before the appearance of the first nucleobase.